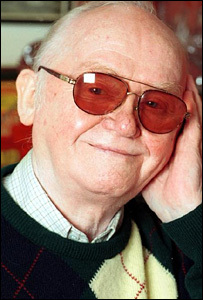 Actor and comic Charlie Drake will be best remembered for his slapstick comedy and his catchphrase "Hallo, my darlings!" He also enjoyed late success in straight theatre. From being the uneducated son of a south London newspaper seller, Charlie Drake went on to become to a multi-millionaire entertainer and one of Britain's best-loved comedians. Drake, real name Charles Springall, was born in London's Elephant and Castle in 1925. He first went on stage at the age of eight, singing Any Old Iron. After leaving school he did various unskilled jobs, and in the evenings went round working men's clubs with a cockney patter act. After serving in the RAF in World War II, Drake turned professional, becoming a noted knockabout comedian, and made his first television appearance in the mid-1950s. He was in the slapstick children's show Mick and Montmorency and then several of his own shows, including The Worker. He often played the put-upon and downtrodden "little man", fighting, often in vain, against the big world. 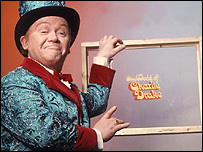 Before long, Charlie Drake was one of television's most popular stars. His catchphrase, "Hallo, my darlings," delivered in his trademark high-pitched voice, was soon to be heard around the country. Gradually the money started rolling in. Drake was starring in films, back-to-back television series, appearing in pantomimes and summer seasons around the country and regularly topping the bill at the London Palladium. In 1961 his novelty record, My Boomerang Won't Come Back, became a worldwide hit. But as fast as he earned money, he spent it. At one point he owned 14 racehorses, a mansion in Surrey, two of the world's most expensive cars, a yacht and spent the rest on gambling. By the time the Inland Revenue demanded their share he was employing 84 accountants and lawyers to sort out his financial affairs. 'I am, by nature, a very big spender. Even as a kid, if you gave me threepence I would blow it straight away," he once admitted. At the 1968 Montreux festival his TV show, The World of Charlie Drake, won the Charlie Chaplin award as the funniest show. The programme included a comic sequence in which he played numerous parts in a comic version of the 1812 Overture. 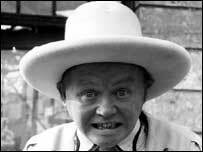 Charlie Drake also made a number of film comedies in the 1960s, most notably Sands of the Desert, Petticoat Pirates and The Cracksman. Then, in 1975, he was fined £750 by the actors' union, Equity, for employing a Leeds housewife who was not in the union to appear in his pantomime. He refused to pay the fine and was blacklisted for 18 months. 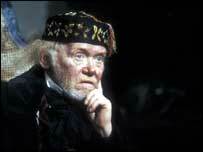 The 1980s saw Charlie Drake turn to straight acting, with some success. He won an award for his part in Pinter's The Caretaker in London and received critical acclaim for his Touchstone in Shakespeare's As You Like It. His Smallweed, in a BBC television adaptation of Dickens' Bleak House, was also well-received. More recently, and in failing health, Drake appeared in pantomime alongside Jim Davidson. Charlie Drake was a perfectionist. He wrote many of his own scripts, and would rehearse again and again until he'd got what he wanted. And, on more than one occasion, he was injured during a slapstick routine. When, in 1961, when he was knocked unconscious during a television sketch, 2,000 people telephoned to see if he was all right.